We carved a pumpkin this year, but I was just too lazy to wash my hands of the slime to document the process. But, it's one fine-looking pumpkin! 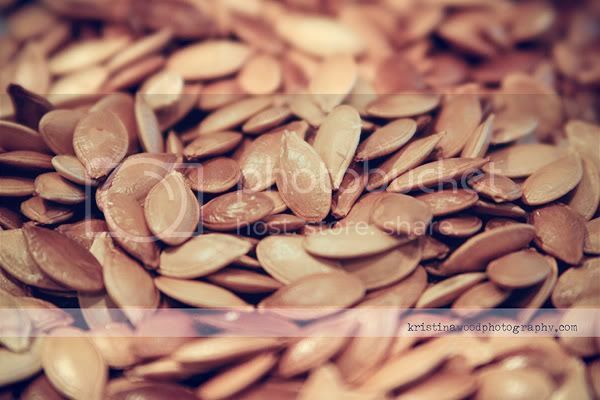 To make toasted pumpkin seeds, we rinsed them off, then baked in the oven for 30 minutes, stirring once after 15 minutes. The recipe called for 500F, but I think that was too hot. They got a little brown. I'd shoot for 450F next time. The first week was really hard on everyone. Last week was much better. Today is the start of week 3. What do we do? I've tweaked it each week, but right now, we take 1 1/2 hours a day, broken up into two segments, one hour in the morning for focused work, and half an hour right after lunch when I read aloud to the girls. It's a steep learning curve, and I'm on the front side for sure. The hardest part so far has been figuring out how to keep the house running and have a few "me" hours in the day. I decided that Monday would be "chore" morning. Each of us has a job to do. Last week the girls washed windows (ok, I never do this, but I thought it would be a "fun" chore for them) while I mopped the kitchen floor (it was disgusting after weeks of neglect.) And, we've also added a Saturday afternoon "family chore" hour when everyone has a job and we all do it at the same time. This week David vacuumed, A dusted, M directed everyone, and I sorted out fall clothes. It's helped me to keep my sanity a bit more this week. So, that's it. If you want more details, just ask! I'm happy to share more, I just don't don't know what else to say at the moment. I'm just trying to keep my sanity at this point. Happy Monday!